Mizuno Wave Enigma is categorized as a neutral running shoe, but has much more structure than a typical neutral shoe. Important features include torsional stability and a firm heel counter, both of which help prevent excessive pronation. 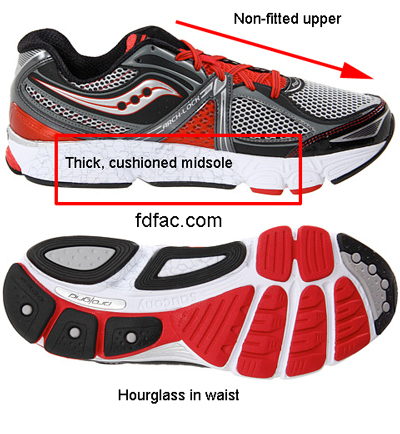 The forefoot is moderately flexible, but sufficiently cushioned to aid shock absorption. The waist of the Enigma is also wide and doesn’t “hourglass” in, making this one of my favorite Mizuno’s this season, as the following field review shows. I recently compared Asics Gel Foundation 10 to version 9. As the following field review of Asics Gel Foundation 10 highlights, this is one of my favorite shoes this season. It’s lightweight, yet structured and although it is no longer offered in narrow — medium and wide widths still provide a great fit. I previously reviewed Asics GT-2170 and compared it to Asics GT-2160. The following video is a field review of Asics GT-2170, which has changed significantly from Asics GT-2160. Although GT-2170 fits the same volume-wise as GT-2160, structure-wise, it no longer supports the excessively pronated foot. I’ve previously reviewed Mizuno® Wave Nirvana 8 but wanted to add my recent field review as well. Important note — this version runs approximately 1/2 size smaller than the listed size, so you will want to evaluate length when assessing fit. I like this shoe, however, it won’t work for every foot type as the following field research shows. I’ve previously reviewed Brooks Ravenna 3 but wanted to add my recent field review. Brooks Ravenna 3 provides a great fit for the rectangular foot. It’s lightweight and cushioned for the neutral runner who doesn’t pronate excessively. ProGrid Omni has always been a solid shoe. For the past several versions, it has offered a rectangular shape and significant anti-pronation control — including a firm medial midsole, firm heel counter, and torsional stability. Version 11, however, has reduced pronation control due to increased midsole cushioning (thickness) and less torsional stability. This makes for a comfortable shoe with a trade-off in less durability and faster wear. In addition to the change from support to cushioning, the upper has also changed from a more fitted style to a more boxy style with a deeper toe-box. For some runners, this may predispose them to a less secure fit than previous models as the following field research shows. Mizuno Wave Alchemy 11 is one of my favorite shoes. It’s supportive and structured without being heavy. Wave Alchemy 12 is equally supportive — but runs narrower than version 11 as the following video shows.